Workers from JD Driver, LTD, of Rose Creek continued a project to fix the west entrance to Stewartville Middle School last week. At a May meeting, the Stewartville School Board agreed to hire the company to do the work for $215,000. 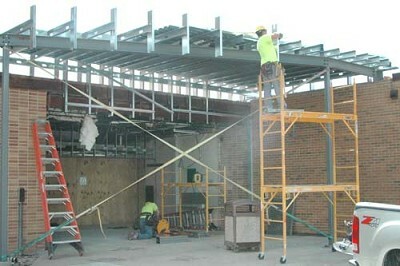 The project includes replacing a set of doors and a portion of the school's roof. Dan Schroeder of School Management Services, the district's business manager, told the School Board in February that the Middle School needed a new set of doors at its west entrance. "Those doors, according to the maintenance crew, are not going to be able to hold up to that much traffic going through them," Schroeder said.